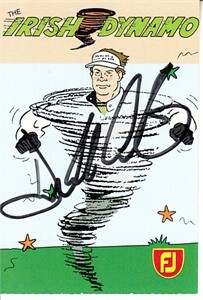 Footjoy golf cartoon trading card autographed in black Sharpie by British Open winner Darren Clarke. Obtained in person, with certificate of authenticity from AutographsForSale.com. Has typical perforations. ONLY ONE AVAILABLE FOR SALE.